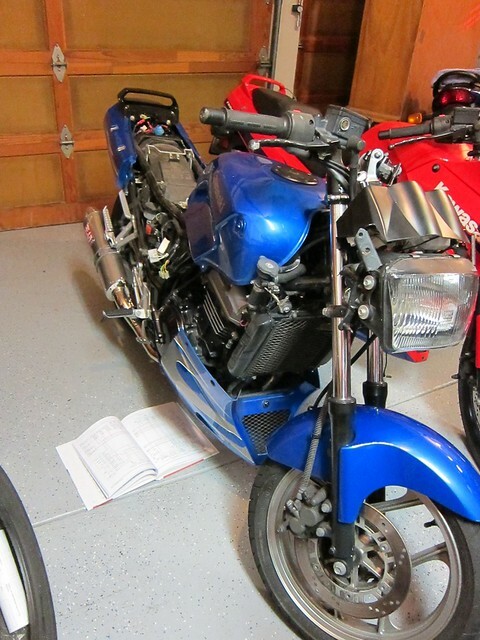 ← I can haz new Ninja! The ride there was good; my biggest issue was forgetting to adjust the friction zone before leaving, so the first few starts from a dead stop were sort of exciting. Things got interesting once we got home, though. One of the things I’d noticed during the ride was that I wanted to adjust the height on the rear brake pedal. Â This was easy enough to do, but when I was finished and I checked the brake lights, they didn’t come on. 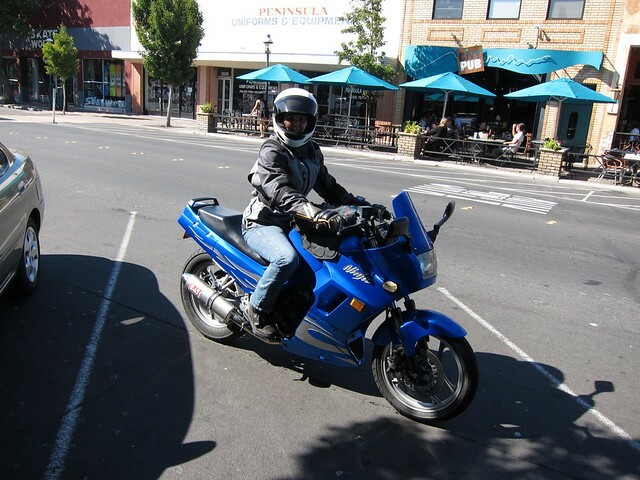 They didn’t come on when I squeezed the front brake lever, either. Now, I had checked all of the lights and controls before bed last night and I know for 100% certain that the brake lights were working then, because I remember noticing that Mike had put a brake light modulator on. I pulled the lens cover off of the brake light and found LEDs, which was only a bummer because that meant it wasn’t something as simple as a burned out bulb. Long story short, Peter and I wound up pulling off most of the fairings and the junction box, and we think we’ve narrowed it down to a short on the wire leading from the fuse marked “tail”. 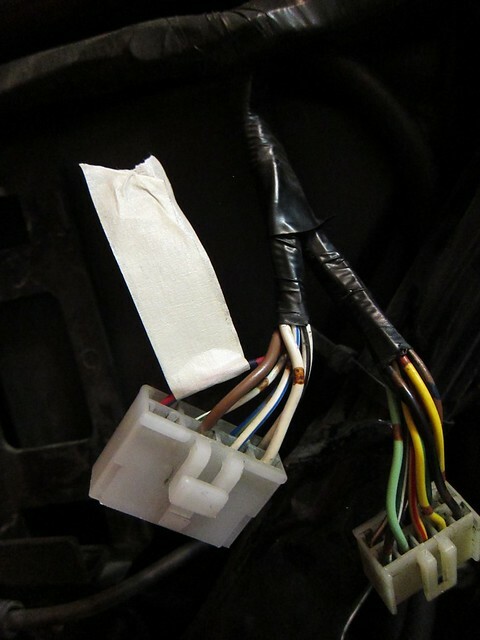 Â The 10amp fuse there blows instantly when the key is turned in the ignition. 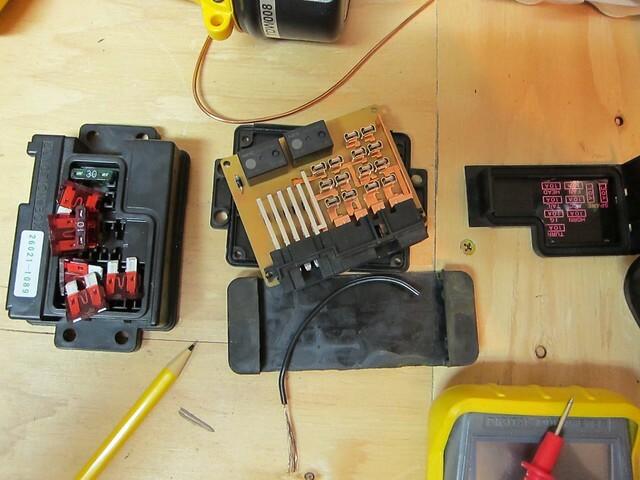 Ever wondered what the inside of a Ninja 250 junction box looks like? We know the junction box itself isn’t the issue because we pulled the one from Glen and Julie’s Ninja (the red one) and installed it. Â Sure ’nuff, the 10amp fuse blew instantly there too, and that is a known good junction box. Â So we replaced the fuse and put that box back in the red Ninja. Right now it’s a bit of a mystery. Â The only thing we’ve done since acquiring the bike is putting handlebar risers on, which I would like to think I could install without blowing a taillight fuse. Â *scratches head* Â Checking the switches (both front and rear) is my next step. Then at least I’ll know whether the short is between the junction box and the switch or between the switch and the taillight. Did you check the blinker fluid levels? I wish I was as handy as you. 🙁 Want to come fix *my * electrical issue?